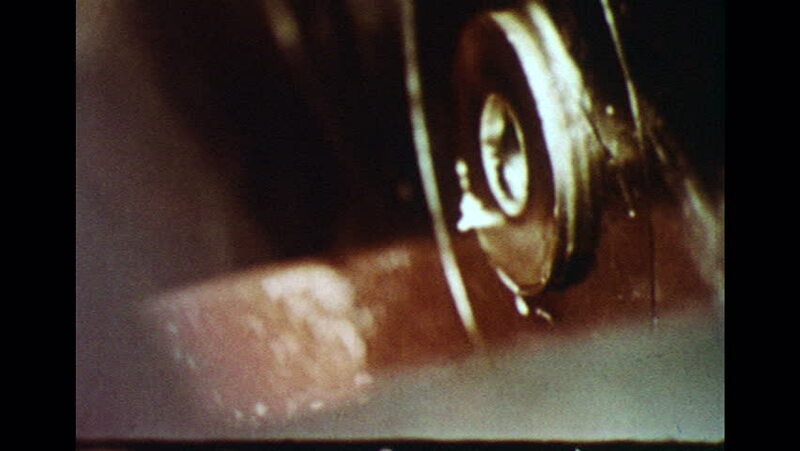 UNITED STATES 1960s: Slow motion close up of machine forming washers. hd00:171970s: Men clean, scrub, wash, and spray equipment. hd00:201970s: Close up, milk pours into measuring cup. Hands mix dough, tilt up to girl. Close up of girl. Hands mix liquid in bowl. Close up of girls. hd00:201970s: A miner drives a vehicle marked EXPLOSIVES into a mine. Another miner gestures to guide him into position. The vehicle stops and the second miner unloads a sack from the vehicle bed. hd00:25Cat on the stairs going on hunt. hd01:04CIRCA 1943 - An airman wears a flak helmet as he pilots the Memphis Belle, a Boeing B-17 Flying Fortress heavy bomber, during World War 2.